Once a paper is deleted, there is no way to restore it! Proceed with caution! A Paper.li publisher account may have multiple papers. Deleting a paper does not delete your paper.li publisher account. If you would like to remove yourself, your email, and all your papers entirely from our database, you may wish to delete your publisher account. Caution: Deleting a WIX paper does not delete the App subscription. If you wish to downgrade the Paper.li News App in WIX, you must downgrade within the WIX website using these WIX instructions. 4. 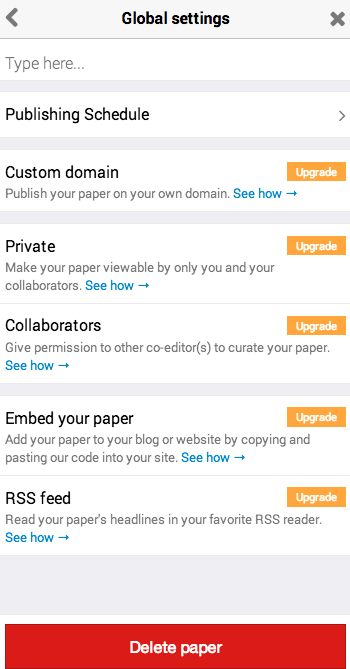 Choose "Your papers" to view a list of your papers under the account and use the delete button to delete the paper(s) you no longer wish to publish. 5. Important note for Pro papers! If you have upgraded your paper to a Pro paper, then you have purchased a Pro plan for that paper only. This means that if you delete your Pro paper, you will also cancel your Pro plan. Pro plans are unique to a paper and can not be "transferred over" to another paper. 1. If you are already signed in and viewing your paper, click the Paper Settings Dashboard icon, top right and choose Global settings. 2. Scroll down the Global settings menu and click . 4. When you click , a field will appear, in which you must type DELETE and click confirm. 5. You are taken to a summary page of your remaining papers. 6. Important note for Pro papers! If you have upgraded your paper to a Pro paper, then you have purchased a Pro plan for that paper only. This means that if you delete your Pro paper, you will also cancel your Pro plan. Pro plans are unique to a paper and can not be "transferred over" to another paper. If you are not able to sign into your publisher account and view your paper, feel free to submit a request and we'll help you get access.